Apple Takes A Swipe At The Credit Card : All Tech Considered Apple wants to change the way you pay for things. Credit card companies are embracing its new mobile payment system as a boost to security, but analysts say Apple could disrupt the payments industry. Apple CEO Tim Cook speaks in Cupertino, Calif., on Tuesday. 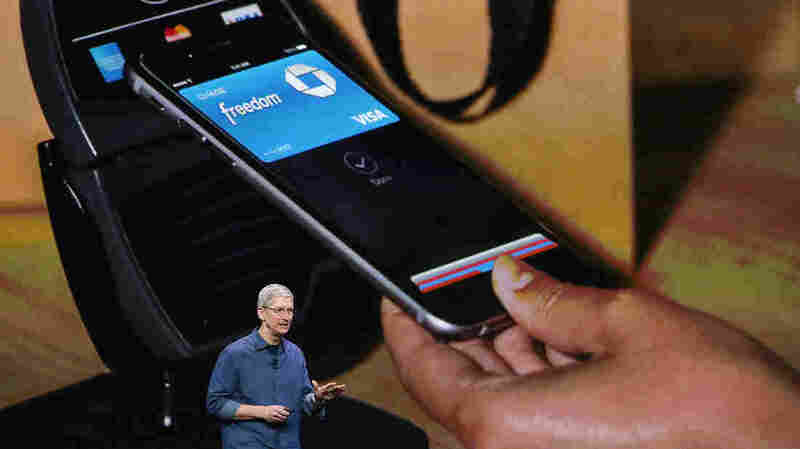 The company unveiled a new mobile payment system called Apple Pay, which uses security built into the latest iPhones. It started with the iPod. In 2001, Apple promised to do away with stacks of CDs and put 1,000 songs in your pocket. Thirteen years later, the music industry is unrecognizable: Most brick-and-mortar record stores have closed, and a pocket-size hard drive filled with music seems quaint in a world with YouTube and Spotify. We didn't know it at the time, but the introduction of the iPod began Apple's shift from Macs to consumer electronics, which resuscitated the ailing computer-maker's fortunes and helped transform it into the world's most valuable company. Next on Apple's list of industries to shake up is something much more basic: how we pay for things countless times a day. Apple is taking aim at what's in our wallet. Our cash and credit cards, as well online shopping. Apple Pay uses what's known as a near-field chip to communicate with payment sensors at store checkouts. It works with Touch ID, a system built into recent iPhones that uses your fingerprint as a pass code. And Apple Pay promises to make transactions more secure at a time when major retailers, including Target and Home Depot, have reported massive breaches of their payment systems. Apple's foray into e-payments was predicted long ago, and it is not the first phone-maker to get into it. Windows and Android phones already have NFC chips for payments. But they haven't caught on. John-Kurt Pliniussen, associate professor of Internet marketing and innovation at Queens School of Business in Ontario, says Apple's entry into e-payments means magnetic strip credit and debit cards are now "state of the ark" — about as relevant as Noah's floodworthy vessel. "The question is how quickly this will dominate the world, because it will," Pliniussen says. Apple has built its corporate empire by making money off apps, music and devices. That got us thinking: What's Apple Inc. going to get out of Apple Pay? Susan Crawford, an Internet policy expert and visiting professor at Harvard Law School, sees the payment system as a way of locking in increased loyalty for already adoring Apple fans. If Apple can leverage its customers' pre-existing trust to help consumers jump over their privacy concerns associated with e-payments, she says, the company may have made one more reason for users to keep their iPhones clutched tightly in their hand at all times. "Really this is all about affection for these devices, which are literally very close to people's hearts," Crawford says. Ryan McInerney, president of Visa, framed Apple Pay as a win-win for both Apple and credit card companies. "Buying things on your mobile phones is not as easy as it should be," he says. Apple "wants to engage their customers on their devices as much as possible." Card companies think that keeping your beloved, trusted phone in your hand longer, and closer to your heart, means you'll spend more money with it — that's good for Apple and good for Visa, MasterCard and the like. Apple reportedly negotiated a cut from the "swipe fees" that card companies charge merchants when you use your card, but Visa's McInerney would not comment on what, if any, agreements were made. It's not likely we will hear an official statement on how much Apple is getting each time a consumer taps a phone on a sensor. Credit card swipe fees are something of a trade secret for companies like Visa and MasterCard — a class-action lawsuit that alleged swipe fee price fixing was settled in 2012. Many retailers say the fees are still too high. Wal-Mart is suing Visa after opting out of the settlement. For new Apple Pay users, the default payment will be the card that is already stored in their iTunes account. That's one less hoop for consumers to jump through before they can start tapping and buying. In the past, Apple succeeded in making money by presenting more attractive alternatives to industries under attack. In 2001, the music industry was battered by music-sharing services like Napster. The iTunes Store's growing clout forced companies to play with Apple and agree to its payment scheme. Today, credit card companies like Visa and MasterCard are scrambling to implement PIN verification systems to respond to repeated massive breaches of consumer data. Credit card transaction fees differ based on whether a card is "present" or "not present." This means that buying something online assesses a higher fee as a type of insurance to hedge against the increased risk of fraud in online transactions. In his keynote address Tuesday, Cook made the security argument by saying the magnetic stripe and 16 digits of plastic credit cards are "outdated and vulnerable." Cook also noted the vast sum of money Apple could potentially dip into: $4 trillion per year charged to credit and debit cards in the U.S. alone. Ed McLaughlin, chief emerging payments officer at MasterCard, also hinted that security was a key appeal. "We see value being generated in many ways," McLaughlin says, including "fraud that can be eliminated." But Crawford, the Internet policy expert, is not so sure the win-win is a permanent win for Visa, MasterCard and the others. "[Credit card companies] are powerful enough that Apple needs them more right now than they need Apple," she says. "But the tables may turn as Apple becomes more like a card processing network." Indeed, Cook hinted at the company's ambitions in an interview with ABC News. When asked whether Apple had killed the credit card, Cook said, "I think that we put a dagger in it." Tim Fitzsimons is a reporter based in Washington, D.C. He writes about technology, business and the Middle East.